Once you’ve taken time to declutter and get organized, it’s important to focus on how you can turn the habits that contribute to clutter into good ones that keep clutter at bay. A shopping list helps for things besides groceries too. I have a list of thing that I need and I watch for at thrift stores, yard sales, and/or Wal-Mart. It’s easier to pass stuff up if I know I am not looking for certain things because I already have enough. If I do buy something then I know I need to weed out a similar item and have a place to keep it. I am always working on a declutter project in my house. I work on one room at a time or an area that needs the most attention. If I am working in the living room I will work on one drawer, cabinet, TV storage area at a time so I don’t make too big of a mess. I decide on what I don’t need any more and put the stuff in a bag to donate. I clean each room or area as I go so they get a deeper cleaning. This is how I keep everything in tip top shape. If you put things away when you are finished it drastically reduces the amount of stuff sitting around the house making it look cluttered. If I eat the dish gets put in the sink as soon as I am finished, or if I do my nails I return the items after I use them. I do this with everything and nothing is left to clean up later. Everything in my house has a home and if it doesn’t I find one. If things don’t fit in the space I allotted then I weed some stuff out to storage or donate depending on the item. If I am working on a project such as crafts or my notebooks I work until I find a stopping point that I know I can put my supplies away. I clean everything up when I am finished I do not leave it sitting to work on for the next day. If certain things are not finished I just get them back out the next time I want to work on it. Sometimes I do make exceptions and I will sit the needed items on my desk but give myself a deadline of a week to finish it or clean it up. I do this every evening in the main living areas, most of the time it isn’t much someone forgot to put shoes away or left a cup setting out. When my kids were younger we would make them put their stuff away or take it to their rooms before bed. I do this every morning in my bedroom too, if I was reading a book or magazine I put these items where they go and I pick up my glass before leaving the room. I also check my husband’s side of the bed for a glass, magazines or maybe he left the remote on the floor. 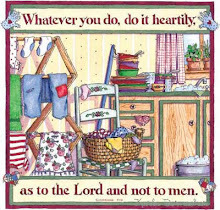 Do at least one load of laundry, dishes, and take out the trash. Obviously this isn’t enough but we are talking about clutter and not cleaning chores. END NOTE: I find a lot of times people are putting thing away or dealing with clutter and not actually doing a lot of cleaning. If you do these things on a regular basis you are able to clean your home without having to deal with everything else.